Through interactive installations, immersive media, interpretive graphics and historic artifacts, this two-year exhibition chronicles the contributions and experiences of Jews in San Diego from the mid-19th century until today. The centerpiece of the project is custom lettering drawn by C&G Partners inspired by an historic San Diego postcard and the graphic appearance of Hebrew script. The type reflects the festive tone of the exhibition. 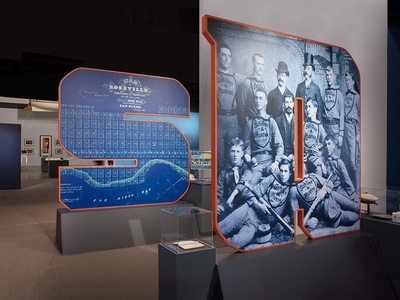 For the show, these letters are converted into sculptural objects that double as thematic displays, exploring San Diego’s Jewish community. 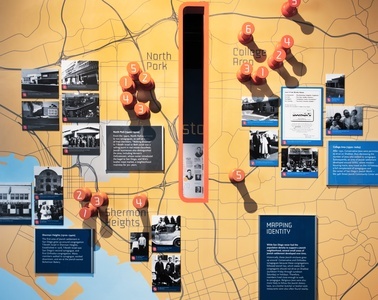 The object-letters feature interpretive plaques, media, and artifacts covering topics that range from community building and innovation to discrimination. The serious yet celebratory tone of the exhibition is embodied in the color palette that includes shades of sky and ocean blue with highlights of sand and sunset hues, adding geographic context to space. 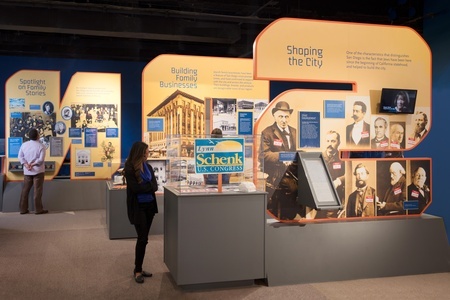 Other displays included historic journal accounts and a video booth that allows visitors today to record their story.